It’s not just the road less traveled that’s worthwhile. 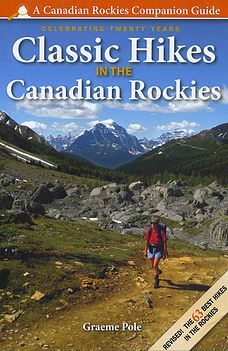 In a Park Radio interview Graeme Pole discussed the 3rd edition of his book “Classic Hikes in the Canadian Rockies.” During the interview Graeme proposed that we don’t always have to go looking for new places to hike. Graeme said, “I feel a bit of a responsibility to the landscape. I’ve seen trails appear where there were no trails.” He explained that the wildlife is boxed in by the boundaries of the parks. We’re pushing the boundaries by encroaching the wildlife when we continually seek new trails. Instead of sending people out everywhere, Graeme recommends trying the well beaten, maintained routes that Canadians through their taxes have constructed and invested in maintaining. The book contains the hikes that have been standard for 30-40 years ever since backpacking caught on. In the interview Graeme said that classic hikes feature trademark views, such as Mount Loui Dogtooth limestone peak and the peaks around Lake Louise. The human history of who’s gone on a path before also contribute to its classic status. With the details in the guide, you’ll gain a newfound appreciation for some tried and true paths. Graeme Pole says you’ll “probably find more elaborate and nuggeted information about wildflowers, wild animals, and natural processes – where you will see them on the trail.” The guide also details natural history, human history, and how and why trails were built and rerouted. If you utilize the cross referencing in the book you’ll gain a bigger picture of environmental concerns and historical issues. The most recent edition has been updated with new maps, new photos, and a more contemporary environmental outlook. Graeme explained in the interview that every guidebook needs to be revised around every 8-10 years because of bureaucratic changes, environmental changes, and changes in the landscape. Sometimes the landscape changes subtly, such as when more humans regularly visit an area. Sometimes dramatic changes occur such as the ones that happened after the Kootenay fires. The book also holds an impressive integrity of information. For example, the pictures of famous sites are taken from the paths that Graeme details, rather than from more convenient vantage points. The book is also designed to be appealing to the eye. What are some of the classic hikes that Grame describes in the book? Listen to the interview “Classic Hikes on Park Radio” to learn more about them! Also, be sure to enter our monthly trivia quiz for a chance to win one of Graeme’s other books!